THOTH KNOWS: HAVE A SHROOM !! IT FIGHTS CANCER BIT*h!!!! In the northeastern woods of Japan and the United States grows a ruffly-looking, exotic fungus with exciting possibilities, both culinary and nutritional. Called maitake or hen of the woods mushrooms, their woodsy aroma, meaty texture, and rich flavor have long given them special status in Japanese cuisine. Now, research is showing that maitake have potential that goes far beyond the kitchen. Traditional Chinese medicine credited maitake and other mushrooms with having medicinal powers for centuries, but in the last 30 years Japanese researchers have examined the specific ways mushrooms act within the body to fight disease and improve health. The results have been encouraging. According to various studies, maitakes appear to boost the immune system, reduce blood sugar levels, aid in lowering blood pressure, encourage weight loss, and help to both prevent and fight cancer. 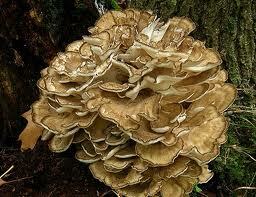 Most of maitake’s health benefits seem to come from one main source. They contain beta-glucan, a polysaccharide compound thought to help the immune system by activating effector cells like macrophages, natural killer cells, and T cells. In addition to their role in general immunity, these types of antibodies also act against cancer. The polysaccharide is also thought to be the source of the mushroom’s ability to control blood sugar to help manage diabetes and improve weight loss. On top of all that, maitakes are also a rich source of minerals like potassium, calcium and magnesium, B vitamins, and amino acids. With all that and the fact that they taste great too, it’s more than worth checking out these exotic fungal gems. For an even easier way to harness the power of maitake mushrooms for your health, also check out Perricone MD’s Maitake Mushroom Extract.